William Wilson & Mary (Chagum) Wilson Signature | "Ever Widening Circle"
I was very interested in all the Revolutionary War paper’s Coni has been posting. I went searching there to see if I could find William Wilson in any of those. My search was for William Wilson in Connecticut. I found a file with a document in it of Levi Hitchcock (does that surname sound familer to anyone else?) in Litchfield County, CT. 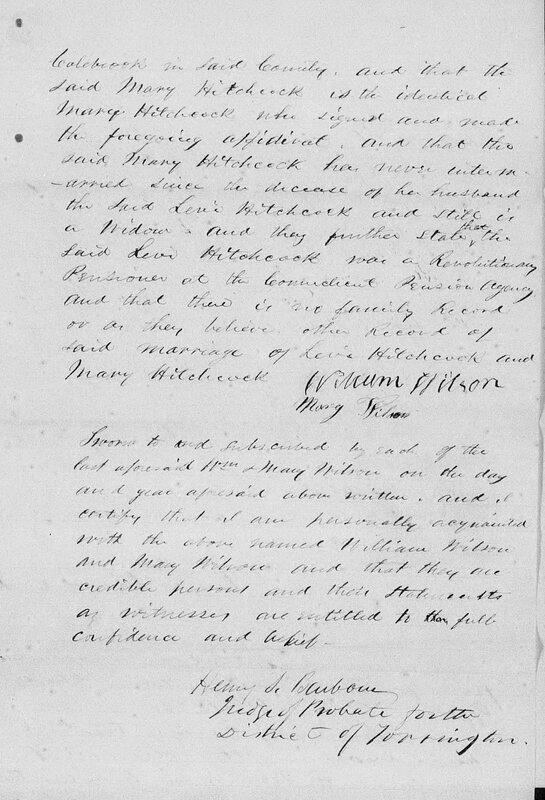 The document seems to be a testimony of William & Mary Wilson of Litchfield County, CT for Mary Hitchcock widow of Levi. I am 99.9% sure that this is my William & Mary (aka Polly) Wilson, who would be Mary/Polly Chagum. As I read further through the old documents, Levi Hitchcock he served in the battle of Montmouth & from Colbrook, CT. That is the same battle that Lewis S. Mills said in his book “The Legend of Barkhamsted Light House” (page 51), Colebrook is the place where William Wilson was a preacher. Are these just a random coindences? I think not!